Welcome back to my trip through my favourite songs of years past - and we're up to 1994, a year dominated by three genres that couldn't be more diverse: big ballads, grunge and Eurodance. First up, a ballad. And not just any ballad - this cover of The Osmonds single was the breakthrough hit for the Irish boy band who'd go on to outsell Take That in the UK for the decade. 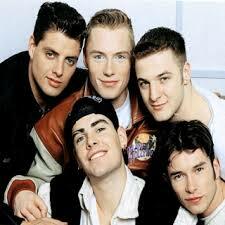 I say "breakthrough" and not "debut" since Ronan, Stephen, Mikey, Keith and Shane had released a different cover (The Four Seasons' "Working My Way Back To You") as their very first single, but it was only a hit in Ireland. "Love Me For A Reason" was the first of 17 consecutive top 5 singles in the UK and came complete with a video featuring some of the pointiest shirt collars of all time. From one distinctive female vocalist to another, and by 1994, Sinead was very much a household name thanks to her 1990 chart-topper, "Nothing Compares 2 U". I'd never been a fan until this song, taken from the soundtrack to the Daniel Day Lewis film, In The Name Of The Father - an excellent movie I haven't ever revisited since it troubled me so much at the time. Co-written with Bono and Irish musician Gavin Friday (who received a featuring credit), "You Made Me..." wasn't a major hit outside of Ireland, but was nominated for a Golden Globe Award. With her involvement in Shakespear's Sister having come to a rather acrimonious end, the singer born Marcella Levy was free to release solo album Jewel, from which this lead single was taken. A dramatic ballad with Marcella's unmistakable soaring vocal, "I Believe" would be the singer's only major hit, although she continues to release music to this day. It had been a couple of years since R&B group Jade's hits "I Wanna Love You" and "Don't Walk Away", and it was beginning to look like their days as a chart act were behind them - but the girls still had one more hit up their sleeve with this track, which also appeared on the second soundtrack album for Beverly Hills, 90210 (subtitled The College Years). Between them, they'd appeared on some of the biggest club tracks of the previous decade and in 1994 dance divas Kym and Jocelyn teamed up with producers Stock and Aitken (yep, I was still a fan, even if no one else was) for a couple of high energy cover versions, including this ZZ Top remake. The other single was an update of the Barbra Streisand and Donna Summer duet, "No More Tears (Enough Is Enough) (number 99 on this list). Credited to either USOA or Movin' Melodies (both aliases of Dutch producer Patrick Prins), this track popped up on one of the many dance compilation albums I bought in the mid-'90s."P.A.R.T.Y." is an example of hardbag music, which was a blink-and-you-miss-it genre back then and a song that has stood the test of time pretty well. A dance track that hasn't dated quite as well is this single featuring Dr Alban-alike Swedish performer Swing (or Swingfly). It's still got a great chorus, though. Janet's first single of 1994 was the fourth track released from janet and it was a bit of an under-performer, breaking a series of 10 consecutive US top 5 singles dating all the way back to 1989's "Miss You Much". Still, Janet wasn't finished lifting songs from the album - not by a long shot. Based on the guitar riff from "Smells Like Teen Spirit" (the Nirvana song was sampled in the original bootleg), this was another dance track that was huge in 1994 - and even cracked the Australian top 20. Tinman was British producer Paul Dakeyne, and "Eighteen Strings" was his only substantial hit. In my 1993 countdown, I mentioned that I went along to the live broadcast of the announcement of which country would host the 2000 Olympics at Sydney's Circular Quay - and it really was a moment for which the country stood still (even if it was at 3am). This dance track captured that moment, sampling both IOC president Juan Antonio Samaranch's declaring "Syd-er-ney" to be the chosen city and radio station 2UE's commentary team. In the weeks after the song's release, an alternate version of the song was issued with the names of other major cities around the country added to give the song more national appeal. Interesting fact: one of the members of Southend was the cousin of a friend of mine who I was with at Circular Quay the night the announcement was made. Aaah, Motiv8. The mid-'90s would've been very different without them and their trademark galloping bassline. The big pop remix team of the day turned their hand to just about every kind of artist - none more surprising than '70s rockers The Doobie Brothers. "Listen To The Music" had originally given the band their first major hit in 1972 and was ressurected in 1994 to promote a greatest hits album, following a re-release of "Long Train Running" the previous year. Purists would have no doubt despaired at the makeover, but I loved it. We'll see Motiv8 again before the end of this list. The lounge singer discovered by Tears For Fears back in the late '80s had enjoyed a considerable hit in 1991 with a cover of "Get Here", but had difficulty following that up with another successful single, despite releasing songs as good as this one. Oleta continued to record throughout the '90s, and has released albums more sporadically since then. Single number four from Haddaway's debut album followed "What Is Love", "Life" and "I Miss You" into the UK top 10 - but it would be the last significant hit from the German-based singer. Here's another dance act with the fourth single from their debut album, but UCC's success had pretty much dried up by this point, despite "High On A Happy Vibe" being a much better song than third single "Sail Away", which had started the demise of the British group's chart fortunes. Here's the biggest hit from a UK pop group managed by Tom Watkins, the controversial music industry figure who helped launch Pet Shop Boys, Bros and East 17. 2wo Third3 weren't anywhere near as successful as those other acts, but one of the four members was Richard "Biff" Stannard, who co-wrote the most successful singles by Spice Girls and has worked on hits for Five, Kylie Minogue and Will Young, among many others. And here is the first of the two massive ballad hits from 1994 you'll find on this top 100 - the comeback release by US vocal harmony group Boyz II Men. The lead single from their second album, cunningly titled II, "I'll Make Love To You" was very much in the style of their previous mega-hit, "End Of The Road", and was also written and produced by Babyface. The song went to number 1 in Australia and the US, where it stayed there for a record-equalling 14 weeks. More Eurodance with the debut single from Swedish singer Anneli Magnusson (aka Pandora), who'd end up scoring a hit in Australia later in the decade with "A Little Bit", but otherwise wasn't widely known outside of Scandinavia. British pop group Scooch certainly claimed never to have heard of Pandora when she sued them in 2007, claiming their Eurovision entry, "Flying The Flag (For You)", plagiarised her song, "No Regrets". Best. Pop. Connection. Ever. We saw this dance act on my 1993 list with "Back Again" and here they are, er, back again, with follow-up single "Poison". There's not really anything else to say, since this is pretty much where the story ended for General Base. If the going was tough in 1991 for Level 42's last album, Guaranteed, and its associated singles, it wasn't much better in 1994 for their next release, Forever Now, and this lead single. As a result of the commercial failure of their 10th studio album, the group split up that year - with over a decade passing before they would reunite to record new music. In 1995, when this track won the ARIA Award for Best Dance Release, group member paulmac famously thanked "the ecstacy dealers of Australia" in his acceptance speech - causing a furore at the time, not least because the National Drug Offensive sponsored the event. Formed by Paul and Andy Rantzen, the group (which had nothing to do with The Simpsons characters of the same names) didn't have another release as high profile as "Sweetness And Light", but Paul has gone on to much greater success as a solo artist and as half of The Dissociatives. Although this is the best known single released by Swedish recording artist Johan Renck, he's made his mark on the music scene as film clip director for artists like Robbie Williams, Kylie Minogue, Madonna and Lana Del Rey. In Part 2, the return of an '80s flash in the pan and the revamp of an early '90s girl group - with an emphasis on "vamp".